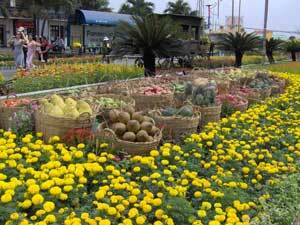 Tet Holiday is the New Year for the Vietnamese with "tet" meaning "festival". Tet Holiday falls on the first night of the new moon in the first month of the Lunar Calendar. This holiday roughly in the Gregorian calendar falls sometime in the last week of January through the first 3 weeks of February. People look at this time as a time for renewal and forget about old problems and begin anew. Many people will have family reunions, give money to family members, and close out debts. At the strike of midnight people celebrate with fireworks and gongs. Everyone on Vietnam becomes one year older because tradition states that the lunar year determines age and not your individual birthday. Tet is a national public holiday time period where government offices are closed and many businesses are closed as well. Tet is celebrated on the same day as Chinese New Year. Tet Nguyen Dan is the full name for the Tet Holiday meaning "Feast of the First Morning of the First Day".